George Washington Pierce (January 11, 1872 - August 25, 1956) was an American physicist. He was a professor of physics at Harvard University and inventor in the development of electronic telecommunications. George Washington Pierce was one of the founding fathers of communication engineering. He was an American inventor, a pioneer in radiotelephony, a noted teacher of communication engineering, and the founder of the Harvard Wireless Club. He developed the Pierce oscillator, which utilizes quartz crystal to keep radio transmissions precisely on the assigned frequency and to provide similar accuracy for frequency meters. Pierce also studied the magnetostriction phenomenon. George Washington Pierce, the second of three sons of George Washington and Mary Elizabeth (Gill) Pierce, was born on January 11, 1872 on a farm near Webberville, Texas, 15 miles east of Austin. When George Washington Pierce senior sired his first son by his second wife Mary, he named him George Washington as well. But in adult life, the son never affixed “junior” to his name. In 1880, when George the son was eight, the town nearest their Texas farm was Webberville, a community of about 200 on the banks of the Colorado River some fifteen miles east of Austin. Pierce’s early life was not much different from that of thousands of other farm boys of the same time and place. Cattle and cotton were the two great staples of rural Texas, and in later years Pierce expressed a hearty disdain for the type of manual labor he was obliged to do in his youth. Shucking corn and watering mules with a leaky bucket was not his idea of how he wanted to spend the rest of his life. Pierce taught in rural secondary schools in his native central Texas until 1898. He manifested his outstanding intellectual gifts in both languages and mathematics early and won an academic medal in the fifth grade of the new elementary school at Taylor, a town 20 miles north of Webberville where his family moved about 1883. When Pierce turned eighteen in 1890, seven years after the University of Texas at Austin was founded, he was just the kind of gifted native son that the young school was looking for. College attendance was still the rare exception then rather than the rule, but Pierce’s excellent academic record and his scores on entrance exams earned him advance-standing credit in English, mathematics, physics, and chemistry. Clearly, Pierce had taught himself much of what he needed to know for these examinations, since neither Taylor nor Webberville, let alone his family, could provide him with much in the way of role models and mentors for the higher academic life. In Austin, he was fortunate to have as his physics professor Alexander Macfarlane (known for his contributions to the theory of alternating currents), a Scot who spent only a few years at the University of Texas. Macfarlane revealed a new world to Pierce, a world where the products of one’s mind were regarded as worthy of attention and value, a world where scientific research carried with it the promise of renown and admission to a class of society that the youthful Pierce could only dream of. Using the rudimentary equipment they found in the newly established physics laboratory in Austin, Macfarlane and Pierce managed to take enough data on the breakdown voltages of waxed paper and oil to write a paper which was published in the first volume of The Physical Review (A. Macfarlane and G.W. Pierce, “On the Electric Strength of Solid, Liquid, and Gaseous Dielectrics,” The Physical Review, vol. 1 (1893), pp. 161-165). In this earliest of his many papers, Pierce set a pattern from which he would seldom deviate for the next forty years. In it, he and Macfarlane used experimental methods to investigate a phenomenon of practical interest to engineers as well as physicists. At that time, waxed paper and oil were two of the most popular insulation materials used in the rapidly growing electric power industry. While their findings did not contribute much to the fundamental physical understanding of dielectric breakdown, the paper answered certain practical questions about how the breakdown voltage changed with dielectric thickness. After graduating from the University of Texas in only three years (1890-1893), Pierce took another year (1894) to acquire a master’s degree there in physics. He then began a four-year period of miscellaneous jobs, such as high-school and college teaching, medical research, and clerking for the Bastrop County Court just east of Austin. This period of erratic employment partly could be attributed to the economic recession that prevailed at the time. Certainly, Pierce’s talents were underutilized in these positions, which were probably taken more as a means of survival than as carefully considered career choices. By 1895, his father and older brother James had both moved into Austin, and two years later James was running a small meat market that was still operating as late as 1910. But George the son had had his fill of cattle, or thought he had, when he returned to the University of Texas at Austin to spend the summer of 1897 in collaboration with another professor of physics, E.F. Northrup, who later moved to Princeton. They wrote two papers together, one of which concerned high-frequency oscillations and resonance effects. Northrup used his connections with members of the Harvard faculty to encourage Pierce to apply for admission there and to request a graduate fellowship. This was the point at which Pierce decided to throw his lot in with the physics community. From Pierce’s point of view, this was largely a leap of faith. The social and economic environment of Texas in the 1890s resembled the circumstances of a third-world country today, and the life of the mind was something he had only read about and heard of from Northrup and Macfarlane. But he must have believed what they told him about the world of academic scientific research, because he applied to the graduate schools of the University of Chicago and Harvard. In later life, he would say that his choice was made in favor of Harvard because he had to work his way from Texas to St. Louis on a cattle train as chief wrangler. As he searched the freight yards for a similar means of transportation, he found a sheep train heading for Chicago and another cattle train heading for the East Coast. For a true rancher’s son, the choice was clear: cattle, not sheep, so Harvard it was. By whatever means he chose Harvard, he recognized at this point that to live a life of research, he had to leave Texas for a place with a longer tradition of higher education. Texas’s loss was Harvard’s gain, and in 1898 Pierce set foot for the first time on the streets of Cambridge, Massachusetts. For the best possible training in the latest physics, the usual thing at that time was to go abroad. Germany was the most favored goal of American physics pilgrims. Accordingly, Pierce obtained a fellowship and spent the academic year of 1901-02 studying with Ludwig Boltzmann in Leipzig, touring the countryside, and learning German and Italian. There is little if any sign in Pierce’s published work of the type of advanced statistical physics that Boltzmann used to establish the kinetic theory of gases. Perhaps the most lasting effects of Pierce’s stay in Europe were a facility in reading German and a high esteem for European physics as a source for the latest ideas to apply in the new field of wireless. Midway through his stay in Germany, Pierce would have learned of the stunning achievement of Marconi, who spanned the Atlantic with wireless telegraphy in December of 1901. Pierce returned to Harvard, where he taught physics from 1903-1940 as both the Rumford Professor of Physics and a professor in Communications and Engineering, offering some of the earliest courses in radio communications. In 1909, he spearheaded the founding of the Radio Society of the Institute for Geographic Exploration, which came to be known as the Harvard Wireless Club, the nation’s oldest club for amateur radio technicians and broadcasters. During his tenure at Harvard, Pierce published numerous scientific and technical papers. Following his appointment as an instructor in physics, he embarked on a series of research projects designed to bring some scientifically-informed discipline to the rough and rowdy world that was then American wireless. It is clear from the record of his patent applications that Pierce hoped to profit from the new technology of radio mainly by means of patent royalties and sales. In 1906 and 1907, he filed several patents on tuning circuits and crystal detectors, and assigned these to the Massachusetts Wireless Equipment Company, probably in exchange for a consulting fee and assistance in filing the patents. Neither these patents nor the ones he filed in 1913-1914 on mercury-vapor tube devices led to any widely marketable technology, although Pierce evidently sold his tube patents to Peter Cooper Hewitt, the inventor of the mercury-arc lamp. In one of his first researches, Pierce used a high-frequency dynamometer to measure the current distribution in a loop antenna. He verified the image theory for antennas elevated above the earth as well as over artificial grounds. He also investigated the effects of both inductance and shunt capacity tuning of receiving antennas. His wave meter was used in wireless telegraphy applications. At resonance, a high-pitched signal was produced in the telephone receiver. After hearing reports of the good performance of carborundum radio detectors, Pierce carried out a long series of quantitative experiments on various minerals used as crystal rectifiers. He was one of the first to employ the Braun cathode-ray tube indicator with a camera to obtain visual images of rectification. His findings convinced him that the thermoelectric theory was not an adequate explanation of the rectification phenomenon. He used a similar experimental setup to study electrolytic detectors and found that, in sensitivity, “the best crystal rectifiers are about equal to the electrolytic detector”. Much of his early research was reported in his classic book “Principles of Wireless Telegraphy”, published in 1910. This book reflected Pierce’s wide-ranging practical and theoretical interests. For several years prior to 1910, he had taught graduate courses in wireless technology at Harvard, and in the preface he said that the book consisted of the “non-mathematical portions” of these courses. Its twenty-eight chapters gave highly readable reviews of the physical principles underlying wireless, described past and current devices and instruments in great detail, and were profusely illustrated with engravings and photographs. Released in September of 1910, the book sold 800 copies by the following April, and received favorable reviews. Shortly after it was published, George Squier of the U. S. Army Signal Corps informed Pierce that the Corps’ Academic Board of the Army Signal School in Fort Leavenworth, Kansas, had recommended the adoption of Pierce’s text to replace one by British radio physicist John Ambrose Fleming. Although a little American chauvinism might have been at work in that case, Pierce’s book was a truly comprehensive and up-to-date treatment of a rapidly advancing field. The fact that he was a professor at Harvard did not hurt, but his substantial physics background and vigorous, clear, non-mathematical prose also helped make the book a success. Writing specialist books was gratifying, no doubt, but neither then nor later was it a path to wealth. For this, Pierce would have to look elsewhere, but not without compromising his view of the integrity and independence of his research work. Pierce became the first Director of the Harvard’s Cruft High Tension Electrical Laboratory upon its establishment in 1914. There he did work that led to the practical application of a variety of discoveries, most notably the Pierce Oscillator, which utilizes quartz crystal to keep radio transmissions precisely on the assigned frequency. Pierce’s exceptional skills as a teacher, as well as his many influential publications and inventions, earned him credit for building the scientific foundations of electrical communication. One of Pierce’s most dominant characteristics was his independence. Absolutely no one could tell him what to work on at Harvard, and he was free to investigate anything within the capabilities of his own expertise and the well-equipped facilities of the Cruft Laboratory. His independence was a habit of mind, along with the ability to drive a hard bargain over anything of monetary value. He made sure to patent most of his practical ideas and defended many of the patents for years against attacks by the largest firms in the communications business, foreshadowing many of the battles over intellectual property that challenge universities today. Yet, when fellow scientists called upon his expertise, Pierce gave it freely and without charge. To scientists, he was open, hospitable, and generous in sharing technical details that would help them in purely scientific investigations. But to corporations, he released valuable information only after receiving what he regarded as fair remuneration. Unlike many academics of his era, Pierce insisted that the industry pay for the privilege of using his patented ideas. Pierce was elected a Fellow of the Institute of Radio Engineers (IRE) in 1915. During the World War I, Pierce was involved in investigating ultrasonic detection of submarines for the U.S. Navy. Among his accomplishments are the invention of a method for recording sound on film and work with nickel and nichrome for the underwater signaling and submarine detection systems that became known as sonar. 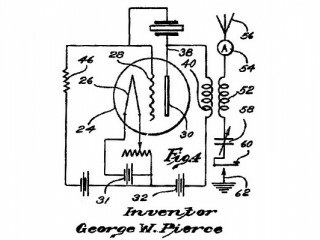 Pierce developed the mercury-vapor discharge tube used to control electric current for sound recordings. He also introduced an academic course on underwater sound signaling. His second book, “Electric Oscillators and Electric Waves”, was published in 1914. In 1917, Pierce moved temporarily to New London, Connecticut to do war-related research for the U.S. government, which dominated his time for the next two years. By 1920, he was a leading radio expert in America, patenting inventions that earned him over a million dollars from industry giants such as RCA and AT&T. Pierce succeeded Edwin H. Hall, remembered as the discoverer of the “Hall effect,” as Rumford Professor at Harvard in 1921. Pierce also was elected to membership in the National Academy of Sciences. During the 1920’s, he added piezoelectric crystals to his research agenda and invented the “Pierce oscillator,” which he patented in 1923. He also studied the magnetostriction phenomenon and received a patent on a magnetostriction oscillator in 1928. His other accomplishments include the mathematical calculation of the radiation properties of radio antennae. He developed the Pierce oscillator, which utilizes quartz crystal to keep radio transmissions precisely on the assigned frequency and to provide similar accuracy for frequency meters. Pierce also studied the magnetostriction phenomenon which is illustrated in this scheme. Magnetostriction is the change in the dimensions of a ferromagnetic material, such as iron or nickel, produced by a change in the direction and extent of its magnetization. An iron rod placed in a magnetic field directed along its length stretches slightly in a weak magnetic field and contracts slightly in a strong magnetic field. Mechanically stretching and compressing a magnetized iron rod inversely produces fluctuations in the magnetization of the rod. This effect is utilized in nickel magnetostriction transducers that transmit and receive high-frequency sound vibrations. A bent iron rod will straighten a bit in a longitudinally directed magnetic field, and a straight rod carrying an electric current will twist slightly in a magnetic field. Pierce brought a good measure of honor to Harvard, to his undergraduate alma mater, the University of Texas, and to his native state with his engineering achievements. He was elected to the National Academy of Sciences in 1920 and received a Medal of Honor from the Institute of Radio Engineers in 1929 in recognition of his contributions to the theory and applications of crystal detectors, piezoelectric crystals, and magnetostriction devices. The award citation also mentioned his role as a leading educator and author of books in the electrical field. In 1943 Pierce also received the Franklin Medal. He was also a member of the Philosophical Society of Texas. These were no small achievements for someone whose first job on record was watering mules with a leaky bucket. George Washington Pierce was married to Florence H. Goodwin on August 12, 1904. After her death in 1945 he married Helen Russell, on November 2, 1946. After Pierce retired in 1940, he continued to pursue profitable legal activities relating to his patent holdings from his summer home in New Hampshire and a winter home in Florida. Well supplied with funds, he built a small laboratory building on his New Hampshire estate to carry on the researches of sound-emitting insects that now attracted his restless energies. Free at last to pursue any line of investigation his heart desired and his resources and ingenuity permitted, he found an apparently endless fascination in studying the katydids, crickets, cicadas, and other noisemaking insects that populated the New England fields in the summer time. A pure scientist at last, his chief delight was now to search out and classify all the noise-making insects he can find on his property and to record their sounds with his instrument. More sophisticated than a simple wire or disc recorder, his device received both audible sounds and ultrasonic components that are inaudible to the human ear. A receiving horn picked up these sounds and sent them to an analyzer. The analyzer, a marvel of compact battery-powered electronic engineering in an era of bulky vacuum tubes, detected certain frequency components and recorded the results on a moving strip of paper tape. This scientist has brought the full powers of his famed expertise to bear on the problem of cricket-chirp analysis, and this instrument was the result. As a result of this research, he published his book “The Song of Insects” (Harvard University Press) in 1948. A series of strokes gradually disabled him and George W. Pierce died at his home in Franklin, New Hampshire on August 25, 1956, at the age of 84. He was buried at Cambridge, Massachusetts. View the full website biography of George W. Pierce.